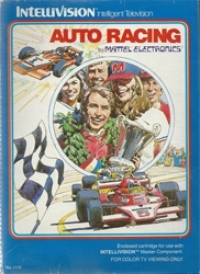 Box Text: Grand Prix action awaits you at every turn. Choose from 5 different courses, 5 different cars. Then take the controls. Zoom down straightaways, clip curves, make a fast break around hairpin turns. You're the driver. The race is on! ...or race two cars, side-by-side. Hug those curves-don’t let your competition run you off the road! -Take on an opponent in a race for points-or compete solo against the clock. -5 different courses vary in length and number of turns. -Study the maps, then “take the wheel”. -“Time Trial” clock displays your lap times in a solo race. -Off the road are trees, houses, water obstacles… hit them and pay the consequences. 01-20-2016 aliensstudios Box Text Grand Prix action awaits you at every turn. Choose from 5 different courses, 5 different cars. Then take the controls. Zoom down straightaways, clip curves, make a fast break around hairpin turns. You're the driver. The race is on! Choose a course and choose a car. Race alone against the clock for 5 thrilling laps… ...or race two cars, side-by-side. Hug those curves-don’t let your competition run you off the road! -Take on an opponent in a race for points-or compete solo against the clock. -5 different courses vary in length and number of turns. -Study the maps, then “take the wheel”. -5 different race cars give you a choice of traction and rate of acceleration -“Time Trial” clock displays your lap times in a solo race. 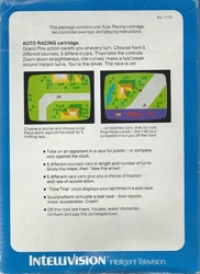 -Sound effects simulate a real race-tires squeal, motor accelerates, Crash! -Off the road are trees, houses, water obstacles… hit them and pay the consequences. 09-24-2011 hexen Box Text Grand Prix action awaits you at every turn. Choose from 5 different courses, 5 different cars. Then take the controls. Zoom down straightaways, clip curves, make a fast break around hairpin turns. You're the driver. The race is on! 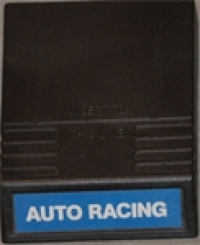 This is a list of VGCollect users who have Auto Racing (blue label) in their Collection. This is a list of VGCollect users who have Auto Racing (blue label) in their Sell List. This is a list of VGCollect users who have Auto Racing (blue label) in their Wish List.